Lexus will continue the V8 IS F sports sedan into 2014 according to an official announcement by the company this week. Unlike BMW, which is moving away from eight cylinder engines in its compact/mid-size sedans and coupes, Lexus will continue to offer the aluminum 5.0 liter, 416 horsepower sedan. The IS line is new for model year 2014, but the IS F and the IS 350C and IS 250C convertibles will carry forward for the coming model year on the previous, Gen-2 platform. 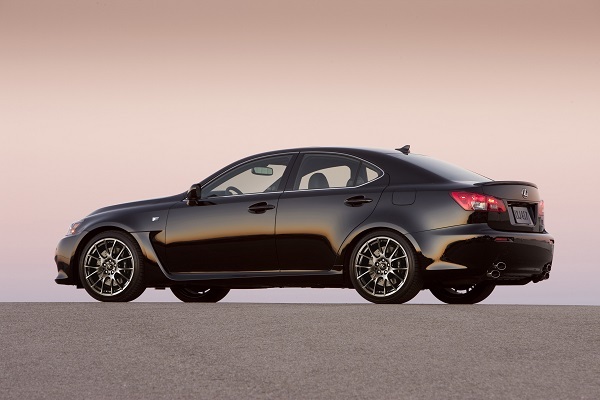 The Lexus 2014 Lexus IS F is now in a much smaller market niche. The luxury-sport four door will be matched only by the Mercedes C63 AMG. Audi does have the splendid RS 5 with a turbocharged small V8, but it is a coupe only. Not that that is a bad thing. The RS 5 is one of the best looking cars in the world at any price point. In terms of performance the IS F is competitive with these two other German peers, but the big news might be 2015. Lexus has hinted strongly that it will build a two-door coupe version of the IS 350 in model year 2014. The unofficial name is the RC. Lexus could have discontinued the low-volume IS F this year if it were planning to retire the V8. After all the new 2014 Lexus IS 350 F Sport is loved by nearly all who drive it and has just this month won a Road and Track full comparison with its arch rival the BMW 335i. It also dispatched the Infiniti Q50S and Cadillac ATS 3.6 Premium. There would be no reason to carry on the IS F with the Gen-2 styling and chassis, were Lexus not planning a new V8 IS F, or RC F (2-door). We will save that story for when Lexus announces the new car. For those planning to buy one of the last of the IS F cars as we know them, the changes to that 2014 model are as follows. A carbon fiber rear spoiler has been added and there are minor interior trim changes. The eight speed direct shift transmission and the wonderful 416 horsepower, 371 pound-feet of torque V8 are unchanged. Also remaining is the Torsen rear differential, titanium valves, hollow, chain driven camshafts, forged crankshaft and connecting rods, and so many more go-fast bits that it boggles the mind they are coming from Lexus. Those interested in a comparison to the coming 2014 BMW M3 and BMW M4 will be interested to note that the IS F has just a smidge more torque, one more forward gear, and 2 more cylinders than the coming, next generation BMW M3 and M4 will have. BMW is moving in its own direction and the Audi RS 5 and Mercedes C63 AMG will now be the closest competitors to the Lexus IS F in many ways.